Do you need a passport to go on a cruise? Passport requirements for cruises depend on where you are going. If your boat only stops at US ports, then no passport is necessary. If you are cruising outside of the Western Hemisphere, you definitely need a passport. US citizens on a closed-loop cruise, one that begins and ends at the same US port, can use a driver’s license or government-issued ID card and a birth certificate, certificate of naturalization or certificate of citizenship. Children under the age of 16 traveling by land or sea can use their birth certificates, as can children under the age of 19 if they are under adult supervision and are traveling with an organization such as a school group, church group, volunteer organization or sports team. If you need to fly to meet your ship at the next available port should you miss your scheduled embarkation in a U.S. port or if you miss a ship’s departure from a port of call. Some ports may have their own entry requirements. 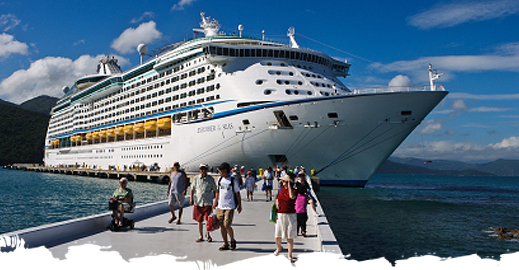 Talk to your cruise line to confirm the documents you need for your cruise. Do you Need a Passport to Go to the Caribbean? No matter where you’re cruising to, RushMyPassport can help you get your passport in time. We personally deliver your passport application to the Department of State, resulting in processing times as low as 24 hours. Don’t let your ship sail without you-apply for your passport today! Im traveling to CUba June 11 for 5 days on a Cruise Just received my passport in mail. Do I need to get a Visa to go there and where Do I get one, from the cruise ship or post office. You will need a visa to visit Cuba. Please contact the nearest Cuban embassy or consulate for assistance. I plan on going on a cruise out of Galveston, TX. I am a US citizen but my wife is a citizen of Mexico. I want to go to Cozumel and Belize. Does my wife need a passport from Mexico to re- enter or does she just need to use her green card. We are going on a seven day cruise I have a passport but my husband doesn't does he need one for these ports?? Cozumel Mexico, Belize, mohagany bay isla roaton, and costa maya Mexico or will the ID/ birth certificate be ok?? My hubby and I have passports. My two kids (4 and 7) do not. they only have birth certs. If we went on a cruise (closed loop) but wanted to disembark at each port city to do sightseeing, should i worry about my kids not being able to get back onto the ship? I know that getting a passports for them is the safest way, but if i can’t get the passports before the cruise start, how much should i worry about my kids? We want to go on an excursion to the British Virgin Islands will the kids need a passport? I'm pretty sure I can answer my question by reading all the other comments but I am wondering if I'm going to have any problems when going on my cruise by taking my permanent resident card and my Mexican passport because I've lost weight so I don't look as chubby and in my passport my hair was red and its dark brown now. should I bring some other from of documentation so they know that it is really me even if I have changed a little or would I be ok? Hi Chelsea, You should be fine with a driver's license or state ID card and a birth certificate, but please contact your cruise line to be sure. Hey, i'm going on the carnival breeze in 29 days for 6 days and i dont have a passport but we are leaving from Miami and returning back to Miami, I know I dont need a passport?? but will i need one to get off the ship in the Bahamas, Jamaica and Grand turk???? PLEASEE help me!!! Hi, We want to take a 4 day cruise to Mexico in 2 weeks, departing and arriving in the same Los angeles port. My Mom has a British Birth certificate. She is a a US citizen but her passport expired in February. What documents are acceptable for her since she does not have a US birth certificate? Does she need a valid passport to travel? Hi Jason, She won't need a passport to get back into the US, she'll just need her green card. However, per the Bahamas Embassy website (http://www.un.int/bahamas/tourist%20visa%20info.htm) she will need a valid passport from her country of origin to get into the Bahamas. Hope this helps! I am planning to take a honeymoon cruise with my fiance from Miami, that travels to Nassau, Bahamas, Cococay (Cruiseline Private Island). I am a US citizen and have my birth certificate and Government ID. My fiance is a Legal Permanent Resident of the United States from Hati and has a social security card and Government ID. Can she travel on this closed loop cruise that returns to Miami without a passport. Hi Juan, You should be fine with a driver's license and birth certificate or naturalization certificate, but do check with your cruise line just to be sure. Have a great trip! I'm planning on going on a cruise that departs from Galveston and stops to Jamaica and Cozumel, Mexico before returning to Galveston. Do I need a passport. Norwegian says only a state-issued driver's license is required for cruises to nowhere. Hi Swendor, Please check with your cruise line to see what's required. Enjoy your trip! Mostly everyone who posted asked about cruises which have ports of call. However, I'd like to go on a cruise to nowhere-leaves NY, goes out in the ocean for two nights and goes back to NY. Is a driver's license sufficient or do I need a birth certificate as well? Thank you. Hi Taylor, You should be okay with a birth certificate and ID, but please contact your cruise line to verify as they have the final authority over whether or not you board. :) Have a great trip! Michelle, For a closed-loop cruise, government-issued photo ID and birth certificates are generally all that's required, however please contact your cruise line to verify. Have a great trip! Hi, I am taking a Pacific Coastal cruise from Vancouver, Canada to Los Angeles, CA. I have a passport card, do I need to get an actual passport too? Thanks! Hi Kellie, Are you a US citizen or Canadian? If you're a US citizen flying into Vancouver to start the cruise, then yes, you'll need a passport to get on the plane. If you're not flying into Canada, a passport card is fine. My boyfriend and I would like to take a closed loop cruise leaving from Galveston and returning to Galveston. I have a passport, but my boyfriend does not. He does have a valid ID and birth certificate, but he is not a US Citizen. He was born in American Samoa (a US territory in the South Pacific) and he is technically a US National, will there be any problem with him going on the cruise or does he need a passport? Hi Lei, He should be fine, but check with the cruise line just to be sure he won't have any problems boarding. Have a great trip! No problem, Maria! As long as it has the raised seal, she should be fine, but I'd recommend contacting the cruise line to verify as they have final authority over whether or not she gets on the boat. Asking this question for a friend who is taking a closed loop cruise. She has the short form birth certificate (her parent' names do not appear on her birth certificate. Can she use this or does she need the full certificate with her parents' names? My understanding is that as long as it has a raised seal, either type of birth certificate will work. Hi, I am leaving on a cruise from Tampa and stopping in the Grand Caymans, and then Cozumel. We will then be returning to Tampa. Do I need a passport or can I get by with the other documents? You should be fine with a certified copy of your birth certificate (the kind with a raised seal) but please contact your cruise line to verify. Thanks! Hi Debi, No, you'll be fine with just your driver's license and birth certificate. Have fun! Hi, I am going on a close loop cruise to the Bahamas with my boyfriend. He was born in Jamaica, but has recently become a U.S citizen. Can his Certificate of Naturalization be used instead of a Birth Certificate or a passport, or is he going to need a passport still? Hi Bowtie, Yes, you should get a notarized letter from his parents. They may not ask for it, but it's always a good thing to have when you're traveling with an unrelated child, and Mexico does require it. If you're going on a cruise with that itinerary, then no. You should be fine with just birth certificates and IDs. Have a great trip! Hi Nanda, Call the National Passport Information Center at 1-877-487-2778. They may be able to help. Have a great cruise! i am deployed in afganistan right now and I'm about to go on leave april 1st. i wanna go on a 5day cruise from tampa to the cayman islands and cozumel. it is a closed loop cause i leave from tampa and return to tampa. do i need a passport? Hi Wes, You should be fine with a birth certificate and driver's license, but please verify that with the cruise line as their requirements may differ. Thanks, and have a great trip! My husband and I are traveling on a closed loop cruise to the Bahamas in a few days. He is a naturalized citizen and cannot find his original naturalization certificate. He still has his passport from his native country as they accept dual citizenship. I spoke to the cruise line and they said that as long as he doesn't need a visa to get into the Bahamas from his native country (which he doesn't) then he should be allowed on the cruise. I'm not sure that's correct. Will he still be able to leave and re-enter NY without his naturalization certificate? (We have his drivers license, a copy (not certified) of his naturalization certificate, his social security card, our marriage license, and his valid passport from his native country.) The cruise line will not give us a definite answer as to what they will do once we arrive at the ship. The worst thing would be if we got on and then he wasn't able to get back home. Hi Cathy, That's a good question. The valid passport from his native country will get him into the Bahamas, but getting back into the US may be a hassle. Now, they actually can't prevent a US citizen from re-entering the country once they verify citizenship, so if they let him on the ship he should be able to get back home- but he might be temporarily detained while they verify that he is in fact a citizen, since he needs a certified copy of his naturalization certificate for proof of citizenship and he won't have one with him. And given that cruise lines aren't supposed to let people on without the documents they need to get back into the US without problems, they may not let him on the ship at all. Has he ever had a US passport before? If so, he could get a replacement passport expedited without the naturalization certificate by including a Request for File Search Form with his application. Otherwise, I would call US Citizenship and Immigration Services and see what your options are: 1-800-375-5283 I recommend that he go ahead and get a US passport once he gets his naturalization certificate replaced, as it also serves as proof of citizenship. Good luck to you both! I'm sure this has been asked and you have been graciously answering repeated questions: My hubby and I have passports. My two kids (4 and 7) do not. they only have birth certs. If we went on a cruise (closed loop) but wanted to disembark at each port city to do sightseeing, should i worry about my kids not being able to get back onto the ship? I know that getting a passports for them is the safest way, but if i can't get the passports before the cruise start, how much should i worry about my kids? Hi, Im going on a 3 day cruise to Mexico in 2 weeks. I DO have a passport, but do not have an ID. Will a passport suffice??? PLEASE HELP. Hi Victoria, Yes, you'll be just fine with your passport! It serves as both ID and proof of citizenship. Enjoy your cruise! We are taking a closed loop cruise (Port Canaveral) in March and are using birth certificates for our son and his friend. Our son's birth certificate shows only mine and my wife's middle initials. Is this acceptable for the purpose of taking this cruise? I know the new requirement for US passport application requires that the full names of both parents be shown on the birth certificate. My son's friend's birth certificate was issued at our county health department (my wife is telling me that the state of Indiana allows county health departments to issue as well as the state vital records department). The certificate says "State of Indiana" on it and has the county health director's signature. Is this certificate acceptable? Both boys will also have their state issued drivers licenses. Also one of our daughters was adopted from China. She has a delayed birth certificate issued by the state of Indiana as well as her US Certificate of Citizenship. Is this all we need for her or is any additional documentation required? Thanks for your insight! Hi Dwayne, For your son, I'm honestly not sure. I can't find any mention of that requirement for birth certificates being applied on closed-loop cruises, just on passport applications. Call your cruise line and ask, since ultimately they decide whether or not you get on board. You're leaving in March, so I would go ahead and contact your state's Department of Vital Records (http://www.cdc.gov/nchs/w2w.htm) to see if you can get him a new one before you sail, just to be on the safe side. Your son's friend should be fine as long as his birth certificate has an official seal. Your daughter should be fine with her certificate of citizenship. I hope you all have a wonderful trip! My sister's and brother in law's passports expires August 12, 2012. We are sailing March 4th-16th, 2012 on a closed-loop cruise from Ft Lauderdale to Grand Cayman, Cozumel, Belize, Costa Rica, Panama and Colombia. Are their passports still good even though they expire within 6 months of the end of our cruise? Are birth certs and DL sufficient for the countries we are traveling to? I don't want to be refused at boarding! Thank you! Hi Karen, You do need passports but your sister's and brother-in-law's passports should be fine. I checked the Department of State's website and Costa Rica and Panama both require passports to be valid for at least three months. There is no requirement listed for Columbia. That said, you should contact your cruise line with your concerns, as they have final authority over whether or not you get on board the ship. Thanks so much, and enjoy your cruise! I am going on a cruise leaving from Baltimore, and returning to the same port. Our only destination is Bermuda. Will I have any trouble getting on and off the ship without a passport when boarding the ship the first day and also while on the island? Hi Samantha, Please contact the cruise line for required ID for your cruise. Have a great trip! I am permanent resident of the united states and I would like to go in a cruise.. Do I need to get a passport and if I do where can I get one. If I take a Carnival Inspiration 4 day cruise leaving Los Angeles and ports in Catalina Ensenada and Mexico , do I have to have a passport? I read alittle and it says with an DL and birth certificate it should be fine. My friend only has an ID not a DL. Is a military ID good to? Hi Jennifer, Yes, you should be fine with a driver's license and a birth certificate. Any government-issued photo is fine in place of a driver's license and a military ID works, too. Have a great trip! Going to the Bahamas. Can I just bring a xerox copy of my birth certificate or does it have to be the original? Hi Yang, It needs to be the original (or a certified copy issued by your county or state). A Xeroxed copy won't work as proof of US citizenship. Sorry! Hi Everybody - I have been on 4 cruises (closed-loop out of New Orleans, Galveston, Mobile, and Port Canaveral). We've sailed to Cozumel, Playa del Carmen, Jamaica, Bahamas, and Grand Cayman. I've taken my husband and 2 children, as well as friends of theirs (who weren't even my own children). You can ABSOLUTELY get on the cruise with your government-issued ID's and birth certificates. We've NEVER had a problem. It's really not as hard as it may seem. I just keep everything in a manilla envelope, along with my travel tickets/itinerary and it makes it much smoother when going through customs and getting on and off the ships. We're going again this year and will do the same thing! Happy travels!! Yes, as long as the cruises are closed-loop, that's all you need. But I'd like to continue to encourage everyone to verify ID requirements with the cruise line before you sail. Better safe than sorry, right? Thanks for commenting, Laura, and I hope you have an even better time on your cruise this year! Hey, I'm going to Bahamas on a cruise leaving from and returning to Miami I have a passport but other family members don't. Will they be able to get off at ports with id and birth certificate??? Hi JD, If it's to Canada, Mexico or the Caribbean you don't have to have a passport but you will need a driver's license and birth certificate. Hope this helps! Im going on a cruise to the caribbean from miami can I just use my Id and birth certificate will I be allowed to get off the boat? Hi Tamika, As long as it begins and ends in the same US port you should be okay, but please confirm with your cruise line and/or the embassies for the countries you'll be stopping in. Have a great trip! Ok...so going on cruise to bahamas to and from miami. A drivers license and birth certificate is enough right? To get off at ports also? You should be fine, Jimmy, but please double-check with your cruise line! If I have a driver's license with my new married name and my birth certificate has my maiden name, will I still be able to go on a cruise to Mexico. Will I have to be sure to take my marriage license as well? Also, if we don't get a passport and just use our driver's license and birth certificate can we get off the boat when it stops in Cozumel, Mexico? Or will we have to stay on board since we don't have passports? Hi Becky, You should be fine without a passport as long as the cruise begins and ends at the same US port. Go ahead and bring your marriage certificate along in case anyone has any questions. Yes, you should be able to get off the boat in Cozumel, as Mexico only requires US citizens to have passports when they go further into the interior of the country. That said, please, PLEASE double-check with your cruise line as they may have stricter documentation requirements. Enjoy your trip! If you are going on a cruise GET A PASSPORT PEOPLE! Yes, if it is a closed loop you can re-enter the U.S. with your driver's license and birth certificate. But, who goes on a cruise and NOT get off the boat and explore and do excursions. I know Freeport didn't check for passports to get off the boat or to get back on, BUT in Nassau they have their own military working at the gate checking for passports when trying to get back on the boat (This military guy gave me a hard time in Nassau bc my picture didn't look like me...I looked chubby in my passport picture and had worked out prior to my cruise). WHEN IN DOUBT GET A PASSPORT! I'm travelling to Ensenada Mexico and am a US Resident but will not receive my renewed passport in time for my cruise? Am I still able to travel. I was told that I can with just my Driver's Licence and my US Resident Card. My family is planning on taking a cruise. One of my brothers is a US resident and has his passport. He is able to go on the cruise, correct? I was informed it had to be US citizens but with the proper documentation and legalization, there should not be a limit to only US citizens I would imagine. Thanks for your help. As long as has a valid passport and a valid permanent resident card, he should be fine. I don't know why anyone would think that only US citizens are allowed on a cruise! That said, you should call the cruise line and verify the documents he needs to bring. Enjoy your trip! I am a texas citizen. If i have a drivers license and a birth certificate i can go on the cruise right? Hi Cruiseboy, You should be fine as long as it's a closed-loop cruise, one that begins and ends at the same US port, and you're only going to Canada, Mexico or the Caribbean. Have a great trip! We are going on a cruise to Bahamaas in Sept 2011. Do we need a passport? or can we us Driver's Licenses or Military ID and Birth certificates. Hi Evette, If it's a closed-loop cruise that begins and ends at the same US port, you should be able to use your driver's licenses and birth certificates. Have a great trip! We are going on a cruise to 2 islands in the Bahamas in June 2011 we are a family of 4/ 2 adults 2 children ages 11 & 14. We are departing and returning to a port in Charleston SC; does anyone need a passport?????? Check with your cruise line, but you should be fine with driver's licenses and birth certificates since it's a closed-loop cruise. I am going on cruise with children their father and I are divorced. I have all the legal paper from divorce and thier birthcertificates. Going to the Bahamas from and back to the same port. Do I have to have his permission to take children. I have Primary custody. Hi Constance, As long as there's no court order preventing you from taking the children out of the country without his permission, you should be fine for the cruise as long as you have their birth certificates. You will need his permission for any travel that requires a passport, however, as the Department of State won't issue passports for the kids without his consent. Enjoy your cruise! I am going on a 7 day western caribbean cruise. Do i need a passport to get off at the ports We are leaving and coming back to Miami. We have 4 stops in other countries. Hi Christine, You should be able to get by with your driver's license and birth certificate, but please call your cruise line to make sure that's all you need. Have a great trip! Hi, I am going on a cruise that leaves from and returns to San Juan, PR. I contacted the ship they said you can use the ID/Birth certificate documents. Is this correct? Hi Kelly, Definitely. That qualifies as a closed-loop cruise. Have fun! I am going on a cruise to that bahamas that departs the US from new york and returns there was well. Im pretty sure I can use the state ID/Birth certificate combo. Is this correct? That's correct, but do confirm with your cruise line just to be on the safe side. Have a great trip! I am planning on cruising from the Port of Galveston to Cancun this June or July. Is this considered a closed-loop Cruise? Will I need a passport? Please respond as soon as possible? Hi Bobbie- If your cruise begins and ends at the Port of Galveston, it is closed-loop and you just need your driver's license and birth certificate to get back into the states. However, Mexico has started requiring passports to enter the country if you are heading more than 20 kilometers south of the border or staying more than 72 hours. So, yes, you probably will need a passport. Contact your cruise line to be sure. Have a great trip!